A powerful three-part set of electroacoustic improvisations from two of Japan's finest experimental musicians: guitarist Tetuzi Akiyama and that famed exponent of the no-input mixing board , Toshimaru Nakamura. This latest long-player commences with the fluttering of pure, high frequency tones laced with complex, scratchy undertones. Akiyama's guitar interjections bring a real sense of warmth to this stream of soft yet austere noise, keeping a low enough profile to fit in with the micro-sonic palette yet proving lyrical enough to lend a Derek Bailey-esque quality to certain passages. During the second track the dynamics occasionally resemble the earliest output of Alva Noto and Ryuichi Sakamoto collaborations, where Akiyama's avant-garde blues phrasings substitute for Sakamoto's open-ended piano emissions. 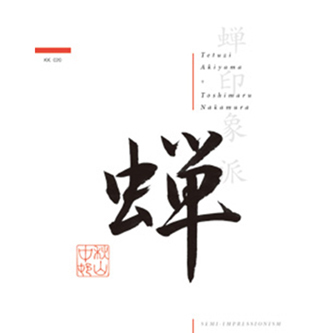 A third and final piece occupies almost twenty-five minutes, arriving with more concentrated emphasis on Akiyama's meandering articulations, and correspondingly, Nakamura's electronics toughen up, arriving in more concentrated and heavily modulated blasts. Recommended.